My current thesis was once described by a kindly reviewer as like ‘watching somebody psycho-analysing themselves,’ and I would call that a pretty accurate observation of my mode of research. It is an intense picking apart of ‘me-ness,’ that is the well-trodden reflexive testing ground of the mentally askew. My research considers ways that trauma finds expression in the work of artists, and comedians are no exception. 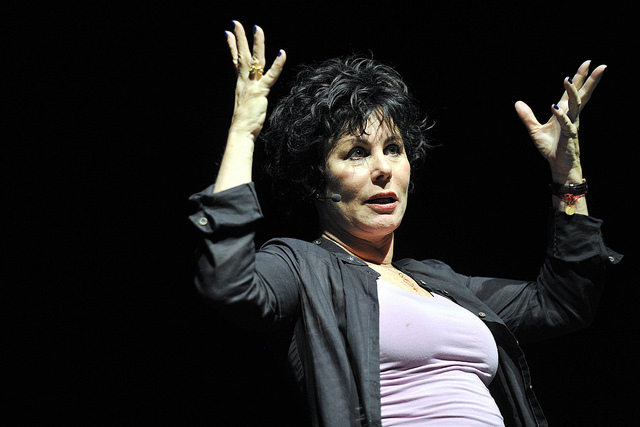 If you’ve ever wanted a to take a crash course in neuro-psychology and were too lazy to read the books yourself then Ruby Wax’s show Sane New World, playing at the Melbourne Arts Centre until this Easter Sunday, is for you. It is also a hell of a lot cheaper than a chat with an actual therapist and probably a whole lot funnier. The show is a therapy taster, replete with Wax lolling about on stage atop her own plush couch, where she reminisces about psych ward trips, manic spending sprees and ill-advised stints on reality television — all highly amusing with the safety of distance. Wax rakes herself over the coals of shame, ego-lust and narcissistic reptilian fervour, but thankfully the show is neither a sob story nor a redemptive moral tale. Without lecturing, but rather delivering the information in easily digestible pop-psych sized chunks, Wax makes no claim to having the answer to ultimate mental well-being. Which is lucky, as anyone who knows a thing or two about the brain understands, because nobody really does yet. What Wax offers is a chance to laugh at the pain and suffering that comes with depression and anxiety, and in doing so she normalises it. Seeing Wax on stage now, the hyper-manic, borderline aggressive energy that epitomised her early television career becomes painfully clearer as the ‘filling up’ of space of an anxious individual who is afraid they are the boring, frumpy fraud in the room. What has replaced that energy is a much deeper thoughtfulness which brings about quite a generous space for the audience in Wax’s private world. If you’ve already got an above average knowledge of current psychology or neuroscience, its safe to say you might not find anything new here beyond the laughs; but if you’re feeling nuts, anxious, confused, depressed and/or completely bonkers and you’re too scared to leap into therapy, then this show has a lot to offer you. The best part is that if you need to, at the end of the night you can still pretend that all you were interested in was a bit of light comedy: the perfect ruse. This entry was posted in Arts, Comedy and tagged comedy, melbourne, Review, Ruby Wax. Bookmark the permalink.